I wrote a short essay for the “Field Test” exhibition catalogue, reprinted below. You can find essays by the exhibition’s other advisers—Mukund Thattai, a faculty member at the National Centre for Biological Sciences in Bangalore, Jane Stout of Trinity College Dublin, Charles Spillane, head of the Plant & Agrobiosciences Centre at the National University of Ireland, Galway, and Andrew Douglas, who created Urban Farm, an agricultural start-up based in Dublin—as well as the exhibition’s curators, Zack Denfeld and Cathrine Kramer of the Center for Genomic Gastronomy, and Lynn Scarff from the Science Gallery Dublin—online here. 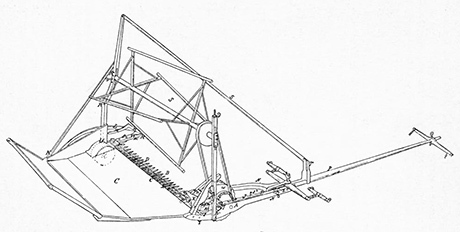 Jethro Tull—the man, not the British prog rockers—invented a horse-drawn seed drill in 1701. Using his machine, a farmer could, with a single motion, sow seeds at regular intervals and at the correct depth. Because Tull’s drill planted seeds in a straight line, it opened up the possibility of using a machine to remove weeds between the rows of crops. Tull went on to invent a mechanical horse-drawn hoe to do just that. Combined, his innovations reduced waste and greatly increased yield: the resulting productivity boost helped fuel Britain’s Agricultural Revolution, and, thus, its subsequent Industrial one. Of course, Jethro Tull’s seed drill—commonly considered the first agricultural machine—also set the stage for many of the most serious problems facing farming today, from monocultures to erosion. 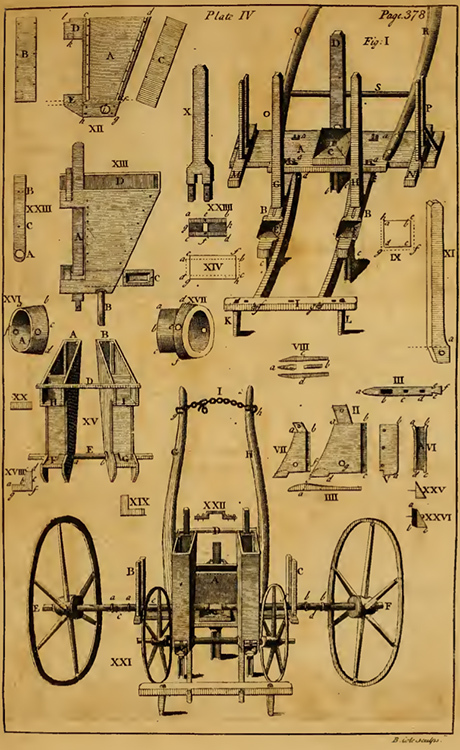 IMAGE: Jethro Tull’s Seed Drill, in Horse-hoeing Husbandry, 4th edition, 1762, via Wikipedia. More often than not, thinking about the future of agriculture means thinking about the future of food. How will changes in the contents of our supermarkets and the composition of our dinner plates reshape the landscape around us in five, ten, or even fifty years? “Field Test” offers a rare opportunity to consider this fundamental relationship from the other, less-considered point of view: how will changes in the science and technology of farming change what we eat—and how we live? If history is any guide, those changes will be both all-encompassing and rather slow. The dawn of agriculture, for example—an invention that is described with equal frequency as humanity’s best and worst idea—eventually led to the development of mathematics, measurement, property rights, and government, while disrupting the planetary nitrogen cycle, triggering the Sixth Great Extinction, rewriting genomes across hundreds of species, and even weakening human shin bones. These kinds of massive changes occurred over millennia, but even smaller shifts take generations: it wasn’t until a century later, in the early 1800s, that Jethro Tull’s seed drill finally displaced the ancient method of hand-broadcasting seed. Farmers are not, as a general rule, Luddites: as in any field, there are first adopters and laggards, and new technology often requires time and iteration in order to work at scale and economically. Plants and animals provide their own inertia, by virtue of their lengthy growing cycles—if a newly planted tree only starts to produce apples after five years, ripping out an orchard to introduce new cultivars or make space for robotic harvesters may also have to wait. Meanwhile, forecasting the future is a notoriously failure-strewn activity; humans are especially bad at imagining transformations that are long, gradual, and interconnected, as those prompted by agricultural innovation tend to be. Nonetheless, the seeds of future farms are here now. IMAGE: Sketch from Cyrus Hall McCormick’s 1845 patent for an improved reaper, via Wikipedia. When Cyrus Hall McCormick’s mechanical reaper machine began the “power farming” era in 1831, it harvested as much grain in a few hours as two or three men could in a day, but it was for the most part seen as noisy, unreliable, and impractical. Few contemporaries had the foresight to imagine that, over the next 150 years, mechanization would mean that farming would slip from a majority activity to a specialised profession carried out by a tiny percentage of the population.